Bobby Sands "was acutely aware of republican history and the power of hunger strike through Irish history"
BOBBY Sands: 66 Days is a new documentary based around extracts from the late republican's prison diary. Brendan J Byrne's film employs a combination of harrowing archive footage, custom animation and dramatic reconstruction along with prison diary narration by Belfast actor Martin McCann to examine Sands's incarceration as well as his motivation for joining the republican movement at age 18. The 27-year-old Belfast man died on May 5 1981 while serving a 14-year sentence in Long Kesh prison for possession of a gun used in a terrorist attack. Sands' death came on the 66th day of a hunger strike against the British government's refusal to grant 'political prisoner' status to IRA inmates – less than a month after he had been elected as the MP for Fermanagh and South Tyrone on an 'anti-H-Block' ticket. The documentary sets the actions of Sands and the nine other IRA hunger strikers who subsequently died in the 1981 protests in a wider political and historical context, exploring their impact on the evolution of the republican movement and the north's peace process. 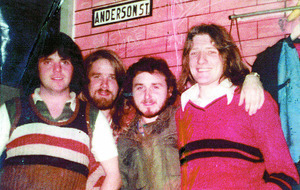 While the Sands family themselves declined to participate, the film features interviews with Bobby Sands' republican comrades including Gerry Adams, Danny Morrison and Brendan 'Bik' McFarlane as well as the recollections of former Long Kesh prison officer Dessie Waterworth, along with contributions from Margaret Thatcher's biographer Charles Moore, former Conservative MP Norman Tebbit and Irish journalist Fintan O'Toole. Byrne, who has previously made TV documentaries on the 1983 Long Kesh escape and Guilford Four man Gerry Conlon, was partly inspired to make the new film after seeing Steve McQueen's Bafta-winning 2008 feature Hunger. "While I loved Hunger, I still came away from it thinking 'Who is Bobby Sands? Where did he come from? '," explains the Ardoyne-born director and producer of the film, which premiered at the HotDocs Canadian International Documentary Festival in Toronto in May. "He didn't come out of nowhere. He'd read republican history, he knew about [Cork hunger striker] Terence MacSwiney, James Connolly and Patrick Pearse. "He was acutely aware of republican history and the power of hunger strike through Irish history dating back 7,000 years." 66 Days' 'calling card' is its innovative use of Sands' prison diary, in which the IRA man eloquently recorded his thoughts about imprisonment, hunger strike and republicanism for the first 17 days of his protest. Its opening line, heard at the start of the documentary, sets the tone for what follows: "I am standing on the threshold of another trembling world... may God have mercy on my soul". "I wanted to make Sands central to the film, so I figured that we'd use his diary to put his voice front and centre of the movie," explains Byrne. "I decided to give the film to Sands – to let the audience be brought along in his words." The diary comes to life thanks to vivid animations by Peter Strain and the voice talent of Martin McCann, who was always Byrne's "first choice" to 'play' Sands. "I've worked with Martin a good few times," says Byrne, who will be bringing 66 Days to Belfast at the end of this month for special Feile / Belfast Film Festival screenings prior to its Irish cinema release on August 5. "I know him well and I like him a lot. I didn't want an 'ack-tor's' voice, I needed someone with an authentic Belfast voice who also understood the delivery. "Marty is originally from west Belfast where Bobby Sands lived for many years, and he's easy to work with." Although there have previously been two major feature films inspired by Bobby Sands in the aformentioned Hunger and Terry George's 1996 picture Some Mother's Son, 66 Days is the first major non-fiction account of the late republican. I asked Byrne why it's taken 35 years for that to happen. "I suppose the obvious answer is just that no-one had been driven to make it," he tells me. "A film and a subject always needs the film-maker to meet it – and I'm the one who's finally went 'ah right, that's my territory – that's the stuff I'm trying to make sense of in terms of who I am and where I grew up'. "The other thing is, I think in terms of ambition for a film a about Bobby Sands, and a factual one, there was probably a nervousness about the controversy surrounding it. "But I think that was a very narrow Northern Irish response, whereas I wanted to make a film for a world audience." Of course, there's little doubt that 66 Days will be illuminating for some viewers closer to home who may have grown up with a different take on what happened to Bobby Sands than the facts support. Byrne says: "There's a particular unionist perception that Bobby Sands was a pawn – that the whole hunger strike was manipulated and that the outside IRA leadership were manipulating them and telling them what to do. "But on the contrary: as Fintan O'Toole says in the film, here was Bobby Sands doing something in prison that in some ways the IRA didn't even understand." Indeed, the film recalls how the vote for the Fermanagh and South Tyrone by-election in which Sands was a candidate fell on the same day as the funeral of IRA victim Joanne Mathers, the 29-year-old Derry mother shot dead on April 7 1981 "for the crime of collecting census forms". "He was sacrificing to gain publicity and yet they were killing people which was getting negative publicity – so it just proves that in the heady days of 1981, there was no grand master plan," the film-maker continues. "There were many different immediate agendas in focus and Bobby Sands was nobody's pawn. He chose the moment and created his own history – as Fintan O'Toole says, not in a megalomaniac way, but as someone who felt he knew what needed to be done at that moment in time to protect the integrity of the republican struggle. And he did it. "That's why he'll probably be remembered as one of the most significant individuals from the second half of 20th century Irish history." While Sands' agreement to stand for election may not have saved his life nor the lives of his fellow hunger strikers, it can now be seen as a watershed moment in the Troubles and for Irish republicanism. "That changed everything," argues Byrne. "The consequences were seismic and significant and we continue to live with them to day. There's no peace process, there's no 'Good Friday Agreement' without it." :: Bobby Sands: 66 Days will screen on Saturday July 30 at Omniplex, Kennedy Centre, Belfast, with additional previews on August 3 and 4 prior to its general release on August 5. See Belfastfilmfestival.org and 66daysthefilm.com/screenings for full details.